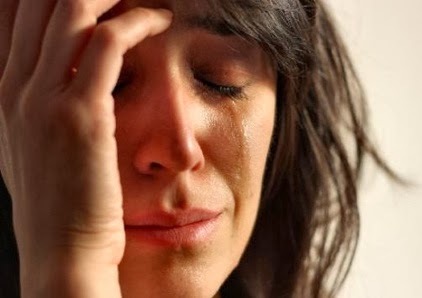 You all know about the meme called "first world problems". What you might not know is that highsec dwellers also have certain kinds of problems that only afflict them. If you live in lowsec, nullsec, or wormsec, you won't face such things. Above is a selection from a recent Highsec Miner Grab Bag item. TheSmokingHertog didn't think he should face any consequences for sleeping while mining. After all, everyone has to sleep--that's life. Except it's not life for pilots in lowsec, nullsec, and wormsec, apparently none of whom sleep. When was the last time someone on TeamSpeak told everyone to keep it down during a fleet battle so he could catch a few Z's? I suppose we're supposed to feel compassion for the 79 year-old miners who can't be bothered to keep their meds within reach of their keyboards. Not a problem--everyone who knows me will tell you that I'm overflowing with compassion. The funny thing is, there aren't any 79 year-olds with meds who live in nullsec. They only live in highsec. Another opportunity for compassion: Tinhorne Greenley's friend is in the hospital and had a stroke. Naturally, Tinhorne had to go AFK for a moment. The story is as sad as it is unverifiable. I might tell Tinhorne that if he were a true friend, he would be visiting the guy in the hospital rather than "playing" EVE by mining all day--but it's not my business to tell people how they run their lives outside of EVE. Only inside of it. Still, isn't it fascinating that no one has ever lost a nullsec battle due to their scouts or FCs going AFK to take calls from stroke victims? Nullsec players' friends are all in perfect health. I guess if someone wants to live a long life, they should tell their friends to play EVE in nullsec. Not highsec, or else they'll befall one disaster after another. Mal Hendar had to eat a sandwich. Everyone's gotta eat. Except outside of highsec, where no one dies while they're enjoying a meal. If you want to save yourself 600 million isk, keep a phone by your computer. Or you can live in nullsec, where no one receives phone calls. Don't believe me? When was the last time someone lost a Nyx because of an ill-timed phone call? Highsec miners have the worst timing. How long do you suppose it takes to get up and grab a beer? Long enough so that our Agents will just happen to kill you while you're AFK. Then again, maybe "AFK getting a beer" means he was at a bar across town. Highsec isn't for multi-taskers. Flapwazzle en Daire was too distracted to keep his eye on the game while mining. And what activity so fatally occupied his attention? Listening to music. Good thing EVE doesn't have sound, or people would be dropping like flies. Another miner complained that he was too busy watching TV to pay attention to the video game he was supposedly playing. Any nullsec fleet PvP'er worth his salt will tell you that spending hours in laggy ti-di conditions can be tedious, too. Yet they remain at their keyboards. 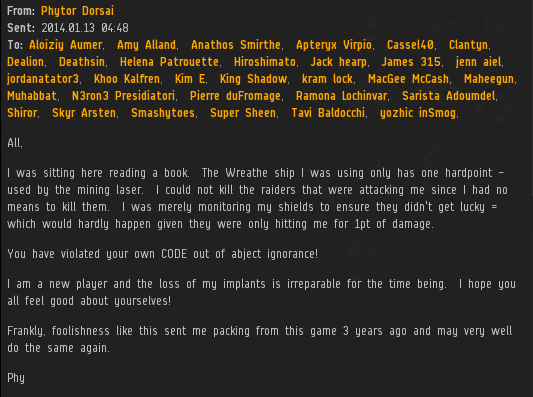 Phytor Dorsai threatens to quit EVE. That would be a real shame, because the EVE community would miss out on a guy who was "sitting here reading a book". Friend, if you want to read a book, go to the library, not highsec. As a side note, I like how he claims to be a "new player" and then admits he was playing EVE three years ago. More highsec problems: Cara Conner was too distracted by her other chat channels to keep her ship safe. In nullsec, pilots are often expected to keep track of multiple channels. Yet they don't die while reading them. Highsec miner channels must be scintillating! Kor Rin died because she's so selfless that she spends all her time helping new players. Physician, heal thyself. It seems Kor's the one who needs help playing properly. Large organizations like GoonSwarm, TEST, and Brave Newbies have helped tens of thousands of new players learn EVE. Miraculously, their instructors manage to deliver instruction and pay attention to what their own ship is doing. Ashawntie Mamari could have called herself an industrialist. She could call herself a miner. Instead, she describes her career as "miner who make there living by mining AFK". That's the truth. AFK mining is the bot-aspirant's career. Going AFK is not something that happens due to an accident or an emergency. Going AFK is not incidental to their career--it is their career. They want to be paid spacebucks for not playing the game. And they feel entitled to it because they happen to live in highsec. 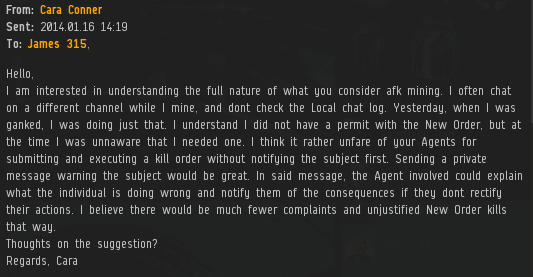 It's the perfect crime, except for one thing: Highsec has a Code now, and a whole 'lotta people willing to enforce it. If you want to mine AFK, go to lowsec and see where your all your tears and excuses get you. Haha. A fun inversion of the old carebear standby of, "Meet my fleet in lowsec, bro." I think the miners are indeed the ones who ought to head to the fertile pastures of lowsec. I hear Aridia is nice this time of year. Man those care bears sure have a lot of quit in 'em, don't they? Need to pee? Answer the phone? Doorbell ringing? Happens to us all- but only care bears insist that it shouldn't affect their game. The rest of us- safe up, dock up, have a fleet mate do a rolling safe-- all accomplished in seconds before leaving the keyboard. And most importantly, it's just a game, so if something in RL is that much of an emergency- the internet space ship on my screen is the last thing I'm concerned with. It's just another excuse in a long list of them every care bear learns during the industrial tutorial I think. "When was the last time someone on TeamSpeak told everyone to keep it down during a fleet battle so he could catch a few Z's?" "And what activity so fatally occupied his attention? Listening to music. Good thing EVE doesn't have sound, or people would be dropping like flies." Afk mining with a T1 industrial and a single mining laser. Wow. Just Wow. This is the point where laziness and stupidity meet. What I see here is butthurt, and some people are genuinely curious. The 79 year-old at least admitted a mistake. Gilgamash seemed curious and asked about what a permit covers. And Cara Connor and Kor Rin were a lot more polite than a lot of people I've seen posted on this site. And they asked legitimate questions, at least in my opinion. I don't think the goal of today's post was to display copious amounts of butthurt, tears and rage - we have the Grab Bag for that. The point was rather to highlight an interesting aspect of carebear psychology that can be observed across the whole spectrum of carebear politeness/civility (or lack thereof). You are absolutely right, I'm just making observations as I see things. Also sorry for the long wait on reply. "Still, isn't it fascinating that no one has ever lost a nullsec battle due to their scouts or FCs going AFK to take calls from stroke victims?" Im sure many pilots in low/null have lost ships due to acquiring alcohol. I know i have. The difference is that for them it is a source of amusement rather than angst. Drunk roams are the best. I will be completely honest here. In low and in null, you would never even dream of going afk in space, unless u a) counting on support of your corp mates and hope they dont bail u out or b) ur completely stupid. The countless times I've seen even mission runners afk in lv4 mission hubs is just plain ridiculous. Everyone knows in eve there are gankers. As mining: I have done my fair share of mining in a Venture: did not see a point to set to mine and go AFK cos of 2 issues: Rats and roids being mined out before ore hold full. If you on a mining barge, i would understand the reason for afk but still have roids to take into consideration. This is a damn game not afk game. So yeah for once I do agree with CODE. up to a certain extend. not a peep from James, guess is not everywhere after all? look forward to seeing how New Order puts there best bump forward. Or it could be that no one cares about Ventures unless they're not a legit rookie, ie a year old. or maybe under the watchful eye of CCP you lack the stones. being ventures should be irrelevant. James says runs all of high sec and seeks to improve the lot of ever miner. Here is a mining op outside his notice or control. When you want to be the "father of hi-sec" there is no option in the Code to be selective. And frankly, if you want to direct players away from carebear attitudes it has to start at the beginning before they are set in ways foreign to the culture of player base. So, over to you. The New Order of Highsec has always played the game entirely within the rules of the game as laid down by CCP, even going so far as initiating and receiving correspondence with CCP's Game Master team to discuss and verify exact rulings. New Order activity has even prompted the Game Master team to open discussion of rules with the community, where rulings were made in favour of the New Order's style of gameplay. Interrupting New Player Training Sessions, however, is very much against the rules. If you want to engage in 'grief' gameplay against the EULA and get banned, that's your call, Anon, but more honourable and virtuous pilots will be running fair, lawful and ethical extortion rackets. @Anon 519: Do you not follow what goes on in this game, like at all? Do you also not understand game mechanics, like at all? It would be cool to try to jump some of the devs or gm's present, but yeah, killing noobs in ventures is pretty stupid. That happened when the training class headed to wormhole space. They even got the CCP rep to sing on teamspeak to save his fleet. Articles like this are the proof that New Order has a real point. We're not just a bunch of gankers running around causing problems. We're playing EVE as it was meant to be played - blowing up internet spaceships. 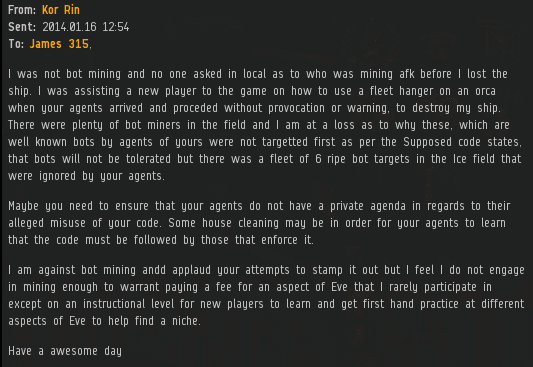 We even do so while targeting some of the worst of EVE's players - those who fling insults, threats, and in other ways seem to have little ability to distinguish reality and fiction. As a former miner, I'm forever glad that I discovered the New Order, which helped me cease my foolish ways (which would have resulted in me walking away from EVE). And for those against the CODE, answer me this - why do you expect to be able to leave the game and be safe?